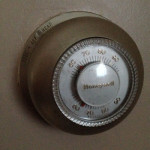 Something as simple as choosing the right thermostat can do wonders for your heating and cooling bill. Getting your system on a schedule you can control, and smarter thermostats now that will help identify areas to save you energy really are worth the investment. 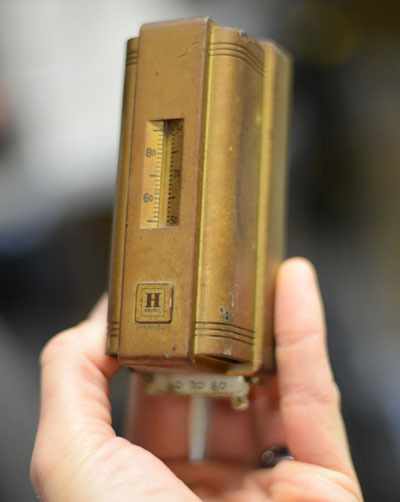 We didn’t have to look long to find this old thermostat in our collection. We do still see a lot of the dial type thermostats with mercury still in them. While they are very reliable and have been in home for years, we can save you money by putting an electronic thermostat in there. Where to start when looking at thermostats? First you want to make sure it is compatible with your system, especially if you are adapting a newer thermostat to an older system. Then they come with scheduling options, starting from a weekly schedule down to a daily schedule of how you want the system to run. Then you get into automated triggers to protect your system from running too long when you forget to turn it on or off, or the climate changes. Now, you can have remote-control capabilities from your smartphones. Where to start? Stop in and we will show you all of the options.